Why Does Influencer Marketing Work? We're happy to tell you. Influencer marketing is a force to be reckoned with, and the industry is showing no signs of slowing down. We’ve all seen the data that supports this powerful form of marketing and the studies that show how today’s consumers are much more influenced by their peers than traditional advertisements. In fact, according to Nielsen’s Global Trust in Advertising report, 82% of those in the U.S. trust recommendations from people they know. 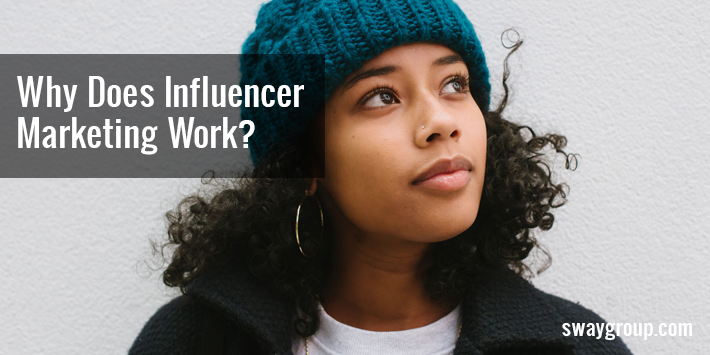 So why does influencer marketing work? How is it that people have come to rely on the word of virtual strangers in their social media communities in order to make buying decisions, and how can we leverage this information to improve our influencer campaigns? This study revealed that just 5% of all branded content gets 90% of engagements, so what is the trick for creating content that resonates? We’ve been in the industry long enough to tell you that it all comes down to two words: human connection. Influencers build connections with their audiences, and in turn, audiences come to respect and trust their opinions and recommendations. These connections happen in a variety of ways, all of which contribute to a thriving environment of marketing opportunities. Over time, influencers become familiar to their audiences, whether or not they’ve met in person or even interacted online. They’re often seen every day via social channels and some share deeply personal content along with intimate glimpses into their lives. These feelings of familiarity and attachment can build to meaningful experiences for audiences. Many of the influencers we work with have relayed stories about strangers stopping them on the street or in a grocery store to inquire about their child or their spouse, using their given names, clearly completely invested in their well-being. An influencer who feels like a friend is treated as such, with audiences responding with support and feedback during their life events. In some ways, it’s similar to to the relationships that people build with television characters or celebrities, except that influencers often provide more access to their personal lives. In addition, most influencers are actually engaging with their audience, responding to comments, giving likes and hearts to audience involvement. When audiences are emotionally invested in an influencer, they are highly engaged and often admiring — this influencer’s recommendations don’t feel like advertisements, they feel like valuable information shared from a trusted friend. Aspirational influencers — the ones with attractively styled, heavily curated content (think fashion bloggers or lifestyle mavens) — continue to have a place next to the more candid, “real life” accounts, and these are the creators who often stir feelings of respect and appreciation. Scientifically, creative admiration goes beyond fandom: when we study the crafts and techniques of perceived masters of a given art, we see our own potential. Audiences are drawn to their style, their home decoration, their beauty, their parenting skills, their hosting ability, and so on — and they’re extremely eager to learn about the products and services that may help them achieve similar results. The notion of the ambient awareness brought on by social networks and photo-sharing platforms is that each individual update may be insignificant or mundane, but when experienced as a whole over time, these tiny glimpses give us a feeling of digital connection with the lives around us. A single instance of seeing an influencer’s morning coffee cup may not be impactful, but ongoing online awareness can expand social ties and feelings of participation and connection. Right now, the true “full access” platform is Instagram’s Stories feature, where creators can share quick images and videos that vanish after 24 hours. The informal, temporary nature of this platform is fueling a new trend reminiscent of the confessional blog posts that were popular a decade ago — influencers are sharing personal, off-the-cuff content via Stories that is often quite different from their regular Instagram feeds. With the recent additions of polls and questions, influencers are also able to create two-way dialogues with their audiences similar in the way that blog comments used to fuel the sense of community. Emotions have always played a role in consumers’ purchase decisions, and today’s digital influencers are the ideal launchpad for brands looking to form authentic bonds with audiences. Influencers already have the trust, relatability, and positive associations. With the right partnerships and campaigns, influencers are the ones who can express brand messages in a way that far surpasses a sales pitch — instead, these brand stories become long-lasting, authentic human connections. We’d love to show you how to create a connection with your consumers utilizing influencers. Reach out!